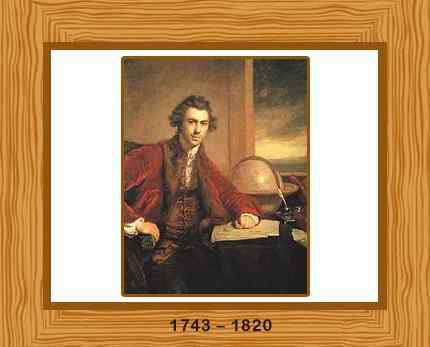 Sir Joseph Banks was an eminent English naturalist, explorer and botanist, noted for his promotion of natural sciences. He also remains the longest serving president of the Royal Society of London. Born in London on January 4, 1743 in a rich Lincolnshire family, Joseph Banks was the son of William Banks, a wealthy landowner. As a child he was very fond of fishing and other country pursuits. Joseph was educated at Harrow and then attended Eton College in 1756. He took admission in Christ Church, Oxford, in 1760. When he left the college in 1763, he had an extensive knowledge of natural history, particularly of botany. At the age of 21 banks inherited the impressive estate of Revesby Abbey in Lincolnshire and was one of England’s wealthiest men with an income of £6,000 per year. Joseph Banks was elected a Fellow of the Royal Society in 1766 and the same year he travelled aboard the frigate HMS Niger to Newfoundland and Labrador to study their natural history. He joined Captain Cook on his 1763 expedition to the Pacific Ocean on the HMS Endeavour. He took an eight man team and a vast amount of equipment with him including a library of over 150 books, microscopes and telescopes. Included in the team was Dr. Solander, a friend of Banks, and a naturalist and artist Sydney Parkinson. The voyage lasted three years and they visited South America including Brazil, New Zealand, Tahiti and Australia collecting and drawing botanical specimens. By the end of the voyage Banks, Solander and two servants were he only survivors from the original nine men. Banks produced over seven hundred copperplate engravings of Parkinson’s art, though it was not until the 1980’s that Banks’ “Florilegium” was fully published. In 1772 Banks and Solander also toured Iceland and collected many botanical specimens. He also established the fact that marsupial mammals were more primitive than placental mammals. Joseph Banks was knighted in 1781. He was made a member of the Privy Council in 1797. He was also appointed an associate of the Institute of France In 1802. Two of his most famous publications include “Short Account of the Cause of the Disease in Corn called the Blight, the Mildew, and the Rust,” (1803) and “Circumstances relative to Merino Sheep” (1809). In March 1779, Banks married Dorothea Hugessen, the eldest daughter of wealthy land owner in Kent. They lived in a house in in Soho Square, London with Dorothea’s unmarried sister Sophia. Joseph Banks died in London in 1820. He was 77 years old and left no family. Banks was buried at St Leonard’s Church, Heston.